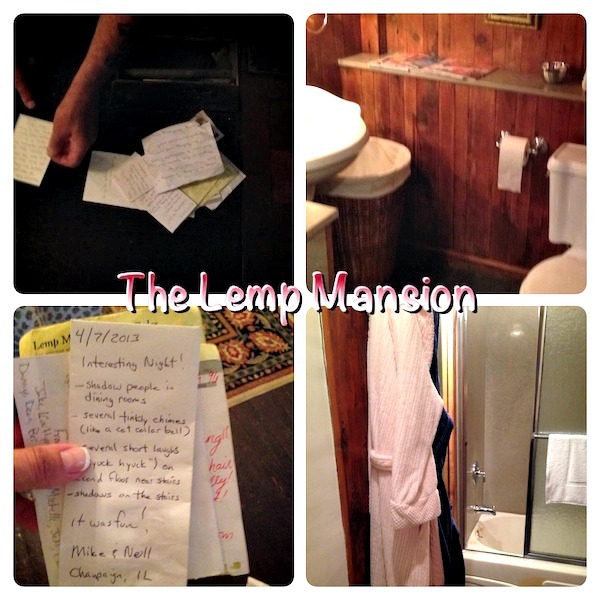 I want to apologize for the images – but I want to provide you something while we shared our thoughts about the The Lemp Mansion in St. Louis, Missouri! 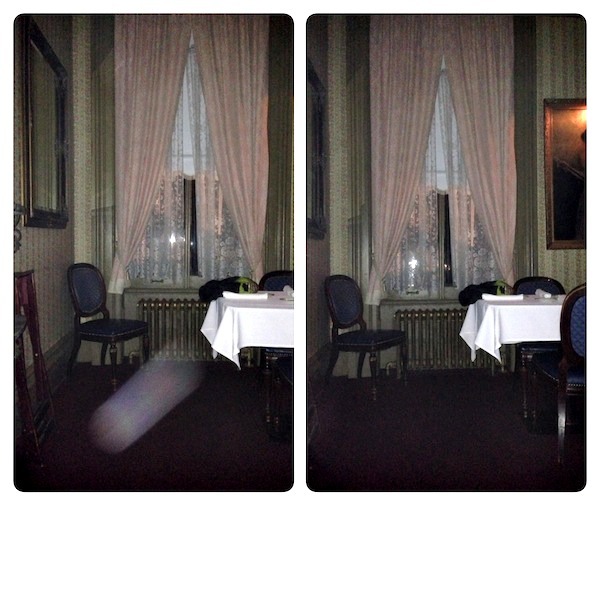 For some reason most of the pictures came out blurry – I wonder if I can blame the ghosts for that!. I do believe in ghosts and really have never been in contact with one, but my husband has. Although I am not sure if I want to meet one or not, I had an opportunity that I knew I could not pass up. 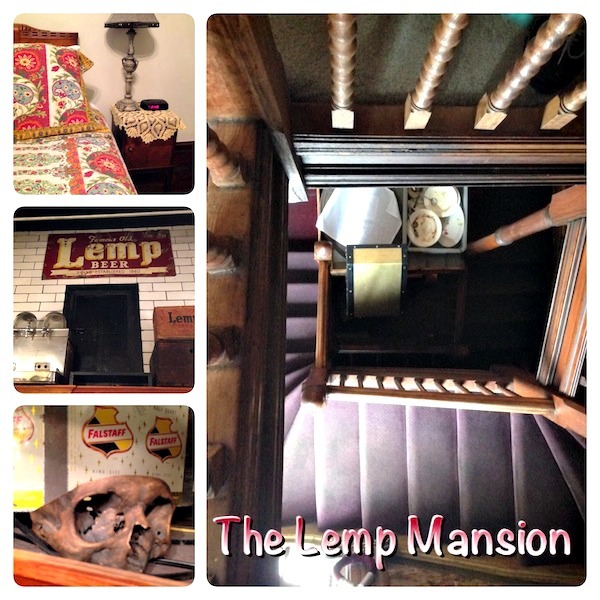 We were offered a night stay at The Lemp Mansion in St. Louis, MO and thought…sure why not? It is one of the top 10 haunted places in America and has been featured on the Travel Channel and haunted shows. 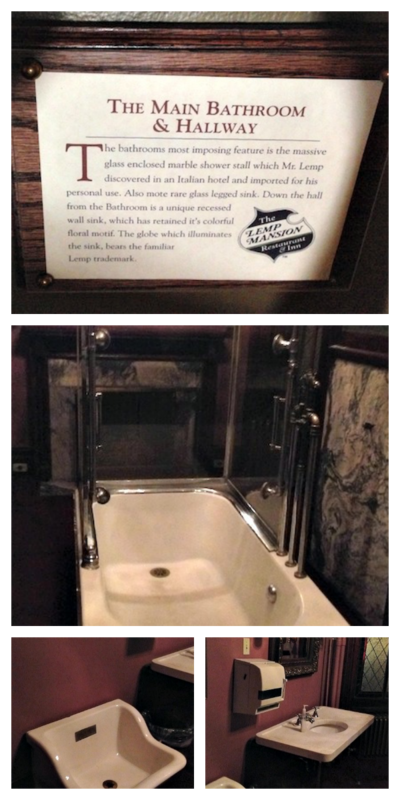 Upon our arrival though, I was quickly having second thoughts! <——- meaning I was terrified as soon as I got there. Check in wasn’t until 5:00 but we had arrived early around 2:00. Luckily they said it was okay and showed us our room. 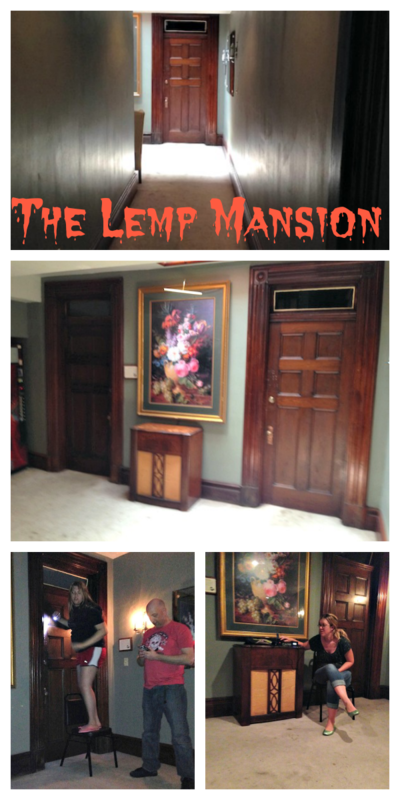 The Lemp Mansion has that eerie feeling as soon as you walk in. 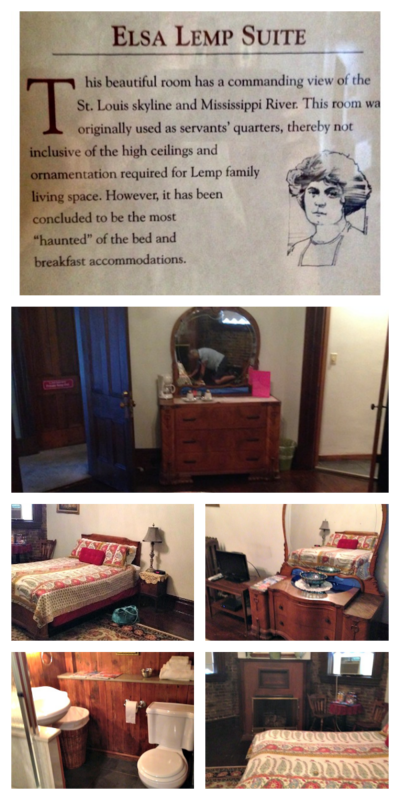 Our room, which was the Elsa room and considered to be the most haunted, was located on the third floor! To make our whole stay at the mansion even more eerie was that fact it was a dark stormy night with lightning and thunder. 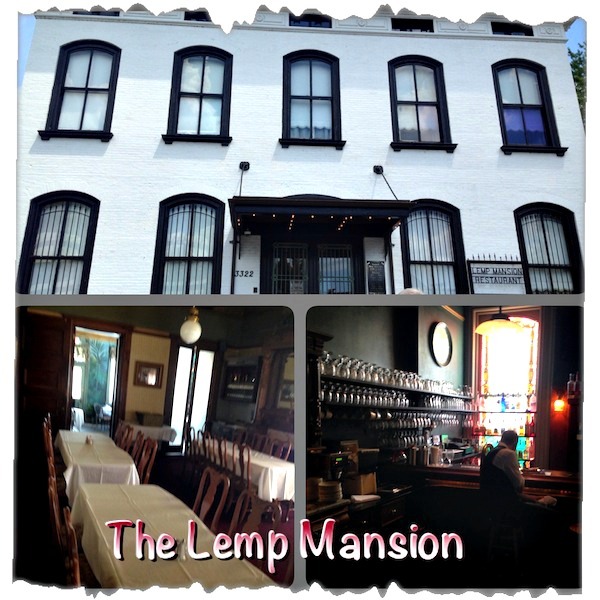 The Lemp Mansion was owned by the Lemp Family who also owned the Lemp Brewery. They had tunnels running from the mansion to the brewery, but have since been closed off. Frederick Lemp, William’s favorite son, died under mysterious circumstances in 1901. William J. Lemp shot himself in the head in a bedroom at the family mansion. William Jr.’s sister Elsa, who was considered the wealthiest heiress in St. Louis, committed suicide in 1920 while in bed. William J. Lemp, Jr. shot himself in the same building where his father died eighteen years earlier. His son, William Lemp III, was forty-two when he died of a heart attack in 1943. Edwin moved away and led a normal life and died from natural causes at the age of 90 in 1970. Although there is no documentation, “the monkey faced boy” is said to be William’s illegitimate son, Zeke, born with Down’s Syndrome and hidden away in the attic which is now the 3rd floor, is said to have died in a fall down the stairs. Our first question was…who else would be staying there that night? Luckily, there were 2 other couples that were related, staying on the second floor so that brought me a little bit of comfort! 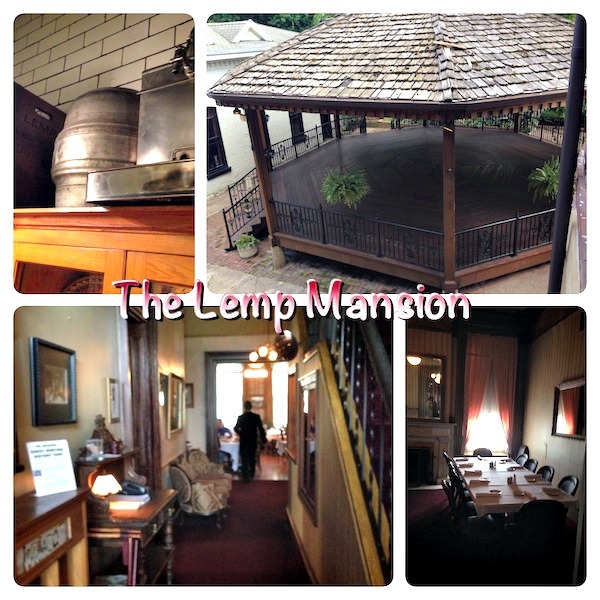 The Lemp Mansion also serves dinner which we decided to stay for. The dinner was very good and I even had an alcohol beverage to calm my nerves. We looked around the room to see if we could figure out who else would be staying there with us. The 2 couples directly next to us were the victims. It was a mother and son and father and daughter. But they were no ordinary couples like us. Noooo, they had done haunted places before and even had ghost technology with them. We were in for a great night or so I thought. The notes in the floor boards of our room! We all headed upstairs to check out each others rooms and get the scoop. They were super nice and I wish I had gotten their names and information so I could email them after we had left, but all I could think of were ghosts. At 10 PM, the restaurant and bar closes and every leaves…locking us in! They gave us a key to the back door in case we needed to escape for any reason. Once locked in, we were free to explore the entire place except for the kitchen and the bar areas. We started on the third floor. Our “Elsa” room, had a loose floorboard where previous guests had left notes for other guests to read about their experiences. It was pretty interesting. Each room also included a continental breakfast, consisting of orange juice, water, muffins, chips and 2 small bottles of wine….which I drank as soon as we were locked in. There was a room located down the hall from our bedroom where rumor has it is where Zeke, who was called “the monkey boy” with Down’s Syndrome was kept throughout his life. In those days, a child with a disability was kept hidden so no one knew about them. They also would not teach them to talk or anything else for that matter. Which is where our first experience happened. The room at the end of hall was locked but had one of those small windows above it, which was open. Soooo, we all decided to try and see in the room from a chair and snap some pictures. While the one girl was up on the chair peeking in, we heard like a growl. I heard it and as she jumped off the chair scared, she said she also heard it. No one but the two of us heard it out of the six of us, but we were convinced that it was Zeke. The one girl had her voice recorder, that picks up spirit sounds, and we heard someone say “go”! 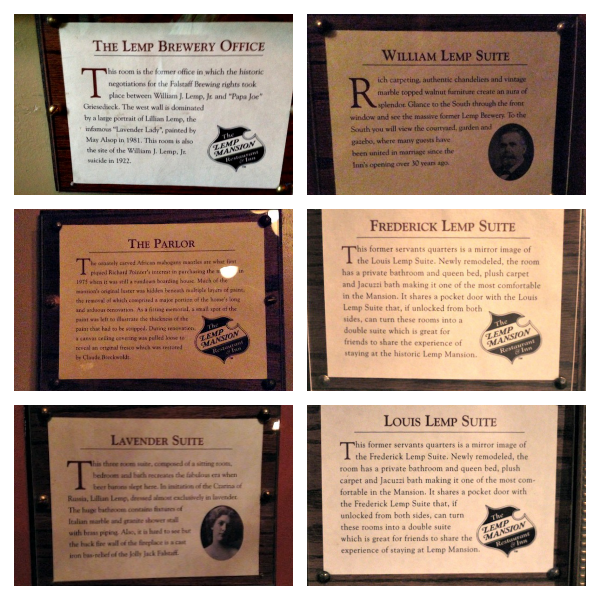 So we headed down to the 2nd floor and explored the rooms there. The one room had a piano that was said to play by itself at night. Nothing exciting happened on there, so we headed down to the basement. All the tunnels were closed off and since nothing was happening, the girl’s son and I headed up to the main floor. And then, that’s where it happened….a ghost pushed me and I went flying! Actually, it was a little step that I supposedly tripped on, but I fell hard and ended up fracturing my arm. 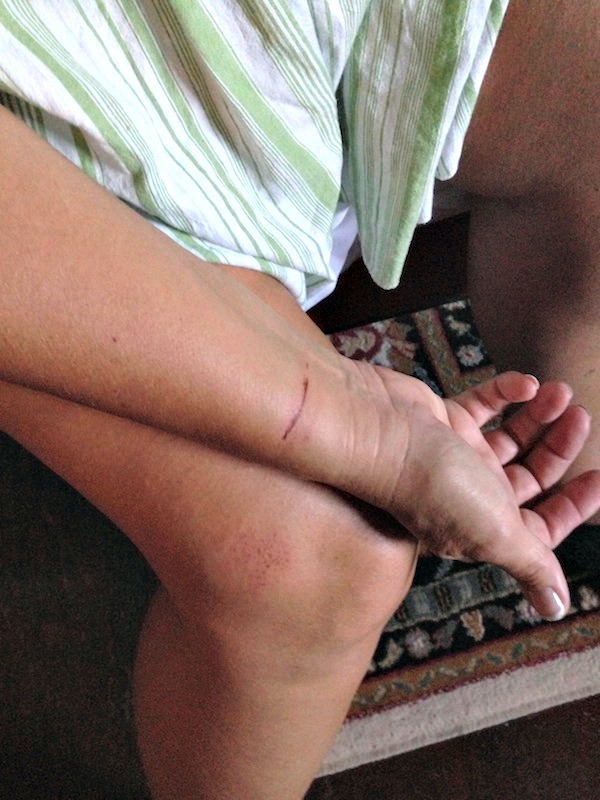 I fell on a rug and a little while later when we were sitting in the dining room where Charles Lemp had shot himself, I noticed a cut on my wrist. Really weird, considering there was nothing on the rug to produce a straight across cut! We snapped a bunch of pictures and I did have an orb in one picture. Tim decided it was time for him to go to bed since he had to drive 8 hours the following day. He laid in bed and turned on the TV. Everything was cool until we all decided to head back up to the third floor. Once we did, he said the TV started acting up and the picture went all screwy. It was around 2 AM and I decided I was pretty tired. I decided to head to bed, not knowing if I would be able to sleep or not. We slept with the light on…just in case and fully clothed. I dozed on and off but didn’t really hear or see anything else out of the ordinary. 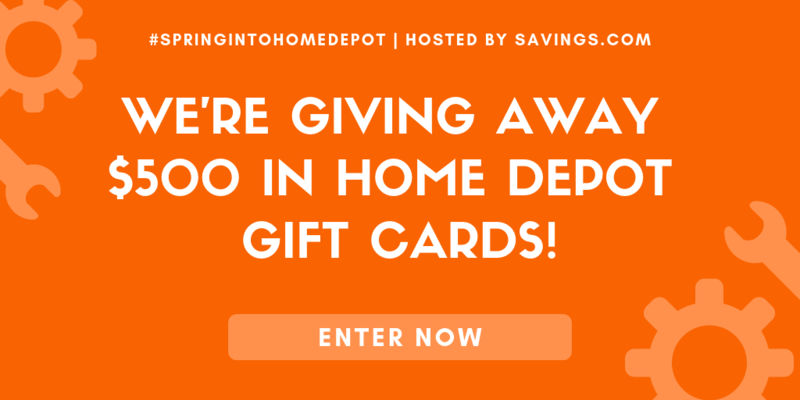 Did you know you can have your wedding there? We woke early and I wanted to see if the others had any more paranormal experiences, but they were all asleep. I would like to go back some time and do one of the ghost tours, which they do every other Thursday. 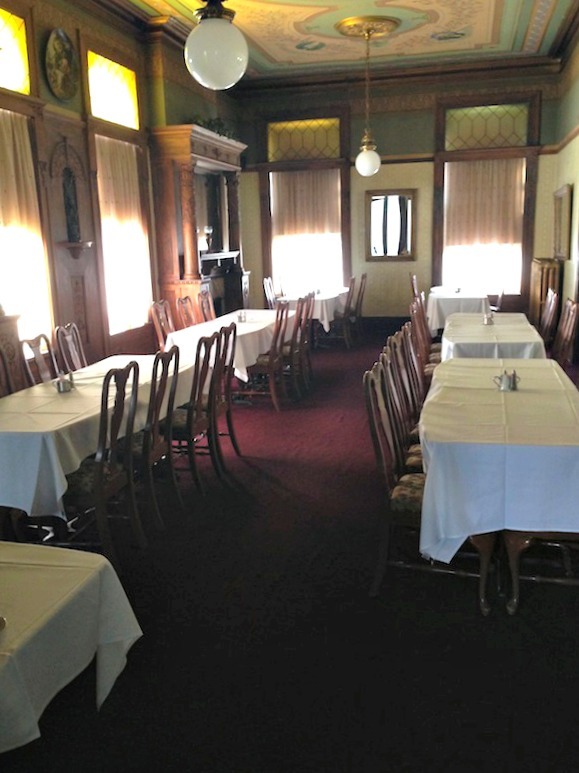 The others had said they had done one previously and had a paranormal experience in the “Zeke” room. They also do murder mystery dinners, which would also be interesting along with being able to have your wedding or other parties there. If you ever get the chance to check it out, I would highly recommend it. There are only two people allowed per room and you can get a discount on tour nights. Because you never know who or what you might see. I would say the cut is from a nail in floor. You didn’t smell lavender from the Lavender Lady, and you didn’t see anything in the main bathroom, the room you stayed in, she loves men in her room and “touches” them, and you didn’t see Mr. Lemp who loves ladies and does something when a lady is in his room. Zeke has gotten stronger through the years, I didn’t know he was like this. He used to roll a ball and play in his room with you. Glad you had fun.